I got the full details screenies in the Media Library! Ever since the 1st Episode 2 teaser, i had the BIGGEST FEELING that Metal Sonic would be playable! Haha! So Metal Sonic will be getting his own levels in Episode 1 through lock-on, just like Knuckles was playable with alternate level paths in Sonic 2 and 3. 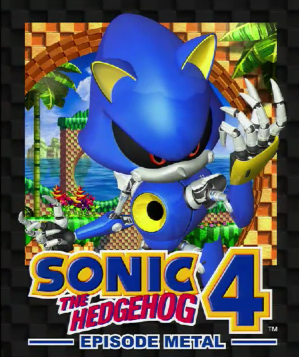 Does this mean Metal Sonic is a playable character in Sonic 4 Episode 2? I just realized since HMS will be replacing Sonic who or what are they replacing tails with ???? I’m guessing either another robot, or he’s so powerful he can do all the combo moves himself. No, Metal Sonic will go through the same levels in Episode 1, just like Sonic. They said there will be “4 exclusive levels” and im not sure if its only for Metal, or for Sonic too (probably both, once you unlock Episode Metal). I do not know if the 4 exclusive levels will be inbetween or after, or scattered around Episode 1 and 2. All i know is that I’m super excited! In the trailer, it showed Eggman reviving Metal Sonic in Stardust Speedway Bad Future! So it looks like that may be one of the exclusive (or the last Episode 2 level) levels from Episode Metal! Ahh, im too excited, maybe because we are one month from release! 😀 Cannot wait! do you not think its abit unfair that Metal Sonic is playable solo and not Tails? but all in all im happy! I would rather play as Knuckles, but w/e. I’m far more excited for the return of Lock-On. Anyone know why they release them on different days? I mean it’s a big deal, but it seems kinda weird whenever to see one released on the 15th and one released on the 16th? Just wondering, is it a developer thing? No, it probably has something to do with the networks (XBLA and PSN a.k.a. Sony and Microsoft). If SEGA could, they would release them on the same day, but not everything can go SEGA’s way. Why do you think Sonic 3 was never released on PSN? Probably because of problems between Sony and SEGA. But you can get around this rule by releasing it on the US PSN first, then the Xbox network as a whole, finally then releasing it on the full PSN. Oh thanks for clarifying! That seems somewhat selfish though, to me. ^Microsoft said that, right? Wow…that’s pretty demanding. Do you guys realize when Ken mentioned that Tails cannot be playable by himself because of certain parts in the game where you need Sonic. to do the big combo roll? – Then how is Metal Sonic going to do it? Maybe he’ll have a special ability to get through those certain segments. Still, how come Tails cannot be playable for Episode 1??? If Metal is in Ep 1, then why cannot Tails be?? This is messed up SEGA. All I really wanted was Tails, not Metal Sonic. tsk, tsk, SEGA. No offesnse, but WHAT game company thinks about semi-villains before brothers?! What the fudge, SEGA. Metal Sonic has special abilities. These are clearly shown in the trailer. I didn’t really pay attention to that lol. I was too busy being wowed that he’s in the game haha. Woah man, calm down! I was curious to why SEGA did that, I wasn’t pissed at all. I bet most people would vote for Tails than Metal, because no one wants a second Sonic. Get off my chest, man. Well, they might just reveal some Tails DLC for Episode I too. Yes! I knew owning both episodes would mean something! Now all those people who do not have Episode 1, but want Metal Sonic, are going to buy it, just for 4 more levels, and Metal. To me, it’s worth it! Its sonic 3 and knuckles all over again, finally metal sonic gets some time in the spotlight to be playable. 4 exclusive levels too, yes! AND AT THE AFFORDABLE PRIVE OF 9595.95! Trailers even better, sooooo want to play as metal. Guess episode metal would act as an episode 0 or something. Metal Sonic 4 Episodes 1 & 2, lol. MS playable in both episodes is a great move. I have wanted to play as MS in a 2d game for ages. Adding 4 extra levels is somewhat expected since EP2 wouldve been last year and it would have been EP3 this year, so in a round-about way, 2 EP’s for the price of 1 (unless you have to re-buy EP1 then 3for2 lol). Nonetheless, cannot wait to nerdgasm over this! lock on? sounds very pleasing to me. i hope its not just metal sonic. i wanna see myself start from splash hill and make my way through that final level in episode 2. oh well…we’ll have to see. Maybe SEGA has something planned. Either there wont be bosses for Metal, or something else wil be replaced in favor of battling Eggman(Ep 1 and 2) and Sonic and Tails (Ep 2). This is strange. :/ Hope SEGA either keeps it simple, or finds a work-around this. “Discover the rebirth of Metal Sonic” and maybe 2nd “death” as he is in a capsule in Sonic Adventure. Sounds cool. I hope “reworked levels” means “fixed physics”, honestly. TURN IT UP! GET DOWN! Some secrets story-wise are about to be revealed when playing as Metal. Ok, what’s confusing me about the episodes being “Lock-on” is don’t they have almost completely different graphics and physics?? How would that work out? Will they be doing a Sonic 4-1 remake to integrate Ep2’s physics into it at least? 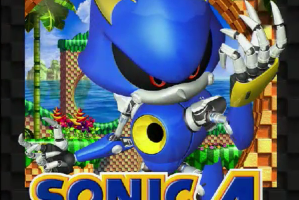 I always said I thought metal sonic should be playable! My Xbox 360 broke before Christmas. On a side note, I hate everyone celebrating. Jealous me is jealous. Oh hey, Stardust Speedway is in that trailer too. See! What’d I tell you guys, lock on IS possible… *tears of joy* Wow…. Metal Sonic, another return of Stardust Speedway, more levels, AND gameplay of the desert level that looks AWESOME! Plus the release dates! YES! May 15th is going to be AWESOME! This is cool. But isn’t fair for those who already bought episode one. They’ll miss out on the 4 extra levels unless they rebuy a game they already have! Or for those who played on Wii. They will have to rebuy the game if they want to play as Metal! A. I think they phrased it wrong: You get Metal AND the bonus levels so long as Episode 1 is on the console. According to the trailer, at least. 2. This game isn’t for the Wii. you missed the point, he was saying that people (like myself) who bought this game on the wii won’t be able to play the metal Sonic epiosde unless they buy it again for a different console, which is really messed up. so we get it free if we own ep 1? interesting, I hope we also get dlc characters like Knuckles and Amy. 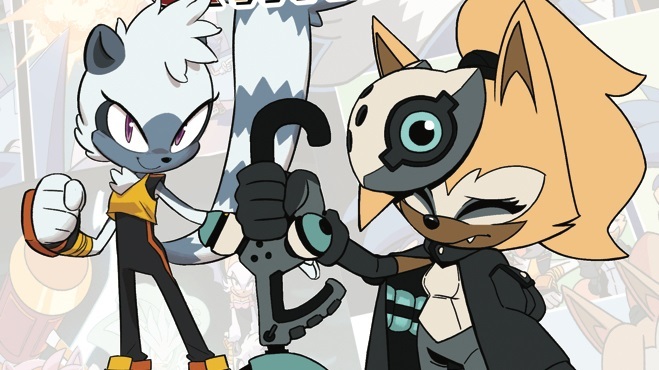 Amy is confirmed to not be in this game at all when they did the character list thing for Project Needlemouse. Hey, Metal Sonic, why the long face? Maybe I’ll just wait and see if it releases on the Wii-U and if you can get the lock-on content there, assuming you can transfer WiiWare games over. Yes, Nintendo confirmed that you will be able to transfer your downloaded games into the Wii U. What has two thumbs and is super excited? WOAH! NOT FAIR! I have episode 1 on the Wii, and this episode isn’t coming out on wii (or any nintendo hardware) so HOW am I going to unlock the episode Metal bonus? Are you going to force me to buy episode one AGAIN on a different platform? That is a real kick in the teeth Sonic Team! Sounds like fun.. as long as he has a new skill or something..
Playable Metal Sonic, not something new but I’m curious to see Super Metal Sonic which I think that was. I’m sad the levels look like a mixture of two levels, but there’s enough originality which makes them inspirited and not super copies like Ep 1 atleast. Anyone noticed Metal Sonic in Stardust Speedway getting shocked by Eggman? what will that be about? Just gonna pinch myself to make sure this isn’t an extremely real dream. Stardust Speedway isn’t an extra zone. It’s just showing how Metal Sonic was brought back to life. Yes, but you may play through stardust speedway to get from little planet to earth/mobius. we shall see. Metal Sonic in Episode 1? That new zone looks great. Has a very oil oceany vibe. Can’t wait. my money is not going through the screen, HELP!!! I got Episode 1 for Wii. I still think its inexcusable that you cant play as Sonic and Tails alone from what I can tell. Apparently, Doctor Who and Eggman have joined forces to rule the world: by using Tardis-powered oil derricks! And after all the hype, we’re still yet to see a single instance of comic mischief! Wait, so does this mean that by having both Sonic 4: Episode 1 and Episode 2, you get four extra levels, bringing the total up to 12? If so, that’s awesome. I assume Metal Sonic will be playable in both Sonic 4: Episode 1 and 2? I guess this is them making up for deciding against Sonic 4: Episode 3. They never decided against episode 3, they are just waiting to see how well episode 2 will sell. I think that’s what Izuka said back before they released generations. i’m wondering somthing dident episode 1 get released same day as the US ? Nope. Wii version came first. Strange that Tails can’t be fully playable but Metal can, not complaining or anything but I don’t understand why Tails can’t be playable (alone) but still I think Metal Sonic playable is awesome and I’m sure it will be a good treat. Maybe they are waiting for episode two to sell well so that they can release an episode 3 with an “Episode Tails” lock-on. That opening shot of Eggman trying to zap Metal Sonic may be failure punishment. WHY OH WHY in this and in Gerneations before dees Stardust Speedway always have a “bad future”? I mean worked hard to get all timestones, destoyed all metal sonic holograms AND destroyed the machines in the past! Why is my hard work all for nothing if its always going to be a bad future there!!?!! Well this is an interesting turn of events. Seeing Metal Sonic back in action is not a pipe dream! I wonder if there might be more DLC for Generations too. Love the inclusion of the lock-on feature just like the good ol-Genesis days! Since Ep. 2 is also coming out on iOS, I’m interested to know how they’re going to manage to implement these “lock-on” features into that version of the game, or even if it’s going to be done for that version at all. Something tells me they might end up becoming an IAP (In-App Purchase), unless the people at SEGA can work miracles for those who can only play both games on Apple devices.